Are you a beginner whitewater rafter? 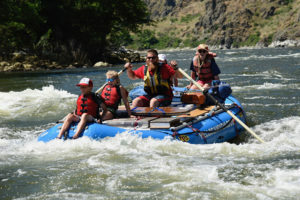 Does your significant other/friend/child really want to jump on a rafting trip but you’re not so sure? Is it continuous whitewater rapids? 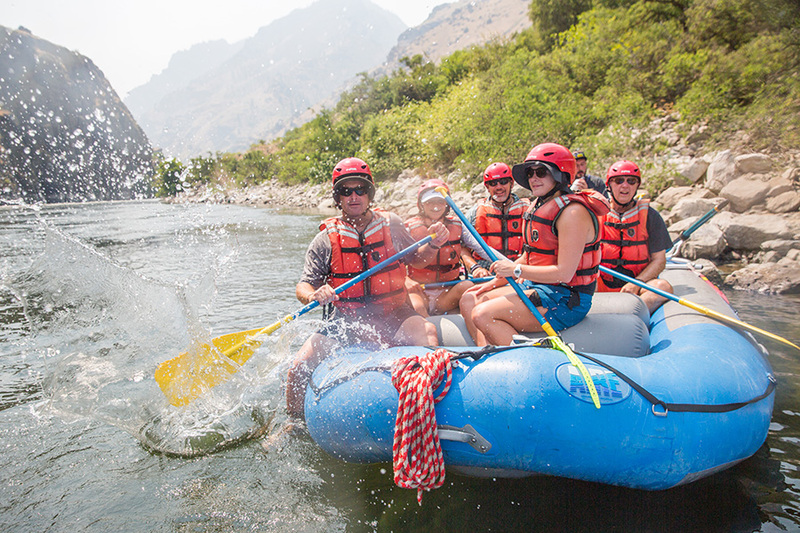 These are some of the most common concerns for whitewater rafting trips. 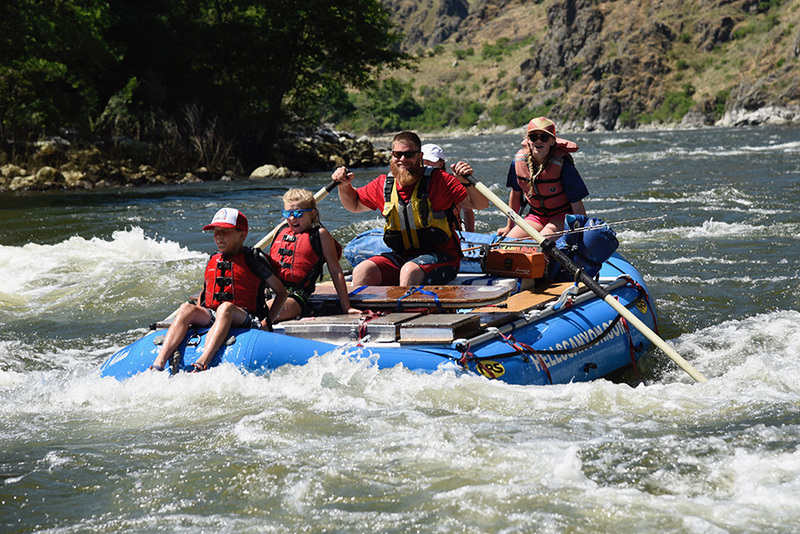 In both Hells Canyon and on the Salmon River, whitewater rapids make up only about 20% of the total time floating on the river. The other 80% of time is spent relaxing on calm water while floating through beautiful canyons. Both the Salmon and Snake River are large volume rivers: wide and deep with few exposed rocks. The rapids are drop-pool style which means the water pools up before a rapid, then drops through the rapid into another large pool of calm water. Many of the rapids feel almost like a roller coaster or the log flume ride at your favorite theme park. Safety is our top priority. There are inherent risks involved with whitewater rafting and there are also safety measures we take to make it as safe as possible. Lifejackets are worn at all times while in the water and on the boats, our gear is constantly upgraded and maintained, and our guides are trained professionals with years of experience under their sun hats. On overnight whitewater rafting trips, camps are packed into a big gear boat, rowed down river, and set up in a new place every night. Your raft arrives to a fully set up camp in the afternoon. This is when the magic of an overnight rafting trip happens. Dinner is being cooked for you and there’s no tasks to do, emails to answer or errands to run. 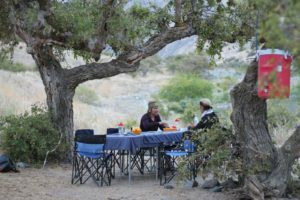 There’s time to bathe and change, take a nap in your tent, fish for bass, play river games, enjoy a beer, or just sit and read with your toes in the sand. Appetizers and specialty cocktails are served nightly before dinner is enjoyed in an outdoor dining area. 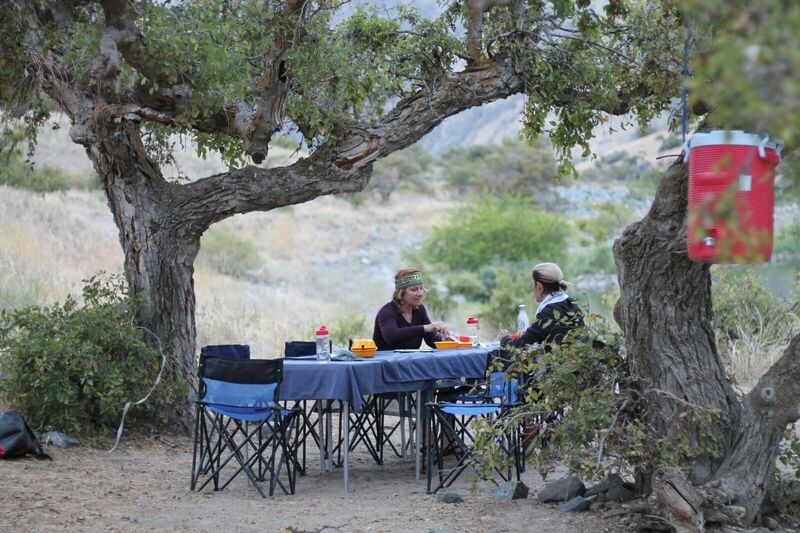 Then there’s dessert and a short walk to your tent. 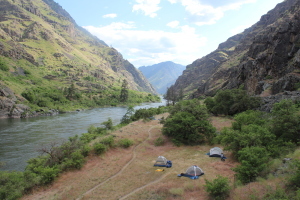 ARC provides a 4-person tents for 2 people, a thick cushy sleeping pad, a sleeping bag, a small pillow and a fitted sheet for a comfortable night’s sleep in the bottom of Idaho’s best canyons. The answer is in the most scenic bathroom you have ever used. We use a system called “groovers” which is a metal box with a toilet seat on top. These are placed in private corners of camp away from tents, boats and kitchen. There’s even a door “lock” to signify that it’s occupied. The groovers come with cushy toilet paper, hand sanitizer, a hand wash station and incredible views of the canyon walls of Idaho. The only tricky part is these are only available at camp, so you’ll have to time your #2’s just right. During the day,#1’s can be done in the river. Dilution is the solution to pollution! Your personal clothing, shoes and tolietires. That’s it. We provide all the rafting gear, camping gear, food and water you’ll need. Sodas, table wine and local micro brews are packed for your enjoyment too, but if you’d like a specific beverage feel free to bring it and we’ll pack it and chill it down for you to enjoy riverside. Here’s our summer packing list to give you an idea of what personal items to bring. We provide large dry bags to pack into and they hold a lot of gear. Crucial items are sturdy and comfortable sandals with a strap holding your heel in, comfortable river and camp clothes, and sun protection. We are always happy to talk rafting, packing, or weather so if you run into any questions don’t hesitate to give us a call in the office at 208-347-3862.